Built from 1907 to 1921 some examples of these wagons survived until 1981as internal user wagon in steel works around the country having been sold out of service in the 1950/60’s. These wagons would have been a seen all over Scotland and the north of England, with some venturing even further afield. This is an etched brass kit with white metal fittings. Built from 1895 to 1921 in the USA at least 2 examples of these wagons were bought by the Furness in 1899 and survived until 1950’s as internal user wagon in Barrow steel works having been sold out of service in the 1930’s. This is an etched brass kit with white metal fittings. Built from 1903 to 1906 in the by the Furness some survived until 1960’sas internal user wagon in various steel works having been sold out of service in the 1940’s. These wagons would have been a seen all over southern Scotland and the north of England, with some venturing even further afield. This kit has a plastic body, etched brass chassis and hoppering with white metal fittings. Built from 1881 to 1898 in the by the Midland some survived until 1930’s. These wagons would have been a familiar sight all over Scotland and England, with some venturing even further afield. This kit has an etched body and plastic chassis with white metal fittings. Built from 1903 to 1906 by the Furness some survived until 1950’s. These wagons would have been a familiar sight all over Scotland and the north of England, with some venturing even further afield. This kit has a plastic body, etched brass chassis and roof with white metal fittings. Built from 1909 to 1910 by the Furness some survived until 1950’s. These wagons would have been a familiar sight all over Scotland and the north of England, with some venturing even further afield. This kit has a plastic body, etched brass chassis with white metal fittings. Built from 1870 to 1910 in the by the Furness, J.S.Claye and others in their thousands for the Lancashire and West Cumberland Ore fields some survived long enough to be preserved. These wagons would have been a Seen in southern Scotland and the north of England. This kit has an etched body and plastic chassis with white metal fittings. Built from 1900 to 1901 by the Furness some survived in revenue traffic until 1958 when they were sold out of service where some lasted until 1981. These wagons would have been a familiar sight all over Scotland and the north of England, with some venturing even further afield the only places they would not have been seen would have been Blaenau Ffestiniog and Ballachulish. This kit has a plastic body with white metal and etched brass fittings. Built from 1904 to 1906 by the Midland for the opening of Heysham Docks some survived in revenue traffic until 1958 when they were sold out of service where some lasted until 1970’s. These wagons would have been a familiar sight all over Scotland and the north of England, with some venturing even further afield. This kit has a plastic body with white metal and etched brass fittings. Built from 1917 to 1928 some examples of these wagons survived until 1981’s as internal user wagon in Derby works with one now preserved at the Midland Railway Museum at Butterley. These wagons would have been a familiar sight all over Scotland and the north of England, with some venturing even further afield. This is an etched brass kit with white metal fittings. 2100 were built from 1900 to 1902 by the Midland with 80 being diverted to the S&DJR. In 1914 some of these wagons passed to the LSWR and some back to the Midland. However 60+ remained in S&DJR livery until 1930. A number of these wagons survived in revenue traffic until 1950’s when they were sold out of service where some lasted until 1970’s. These wagons would have been a familiar sight all over Scotland and England. This kit has a plastic body with white metal and etched brass fittings. Built from 1900 to 1902 by the Midland, a number of these wagons survived in revenue traffic until 1950’s at various locations around the country. This kit has a plastic body with white metal and etched brass fittings. Built from 1903 to 1923 by the various wagon works around the country some survived until 1950/60’s having been pooled in World War 2. These wagons would have been a familiar sight all over Wales, Scotland and England. This kit has a plastic body, etched brass chassis with white metal fittings. Built from 1900 to 1901 by the Midland some survived until 1960’s with at least one being preserved at Chesterfield. These wagons would have been a familiar sight all over Wales, Scotland and England. This kit has an etched body and plastic chassis with white metal fittings. Built from 1890 to 1901 by the North Staffs some survived in revenue traffic until 1930’s. These wagons would have been a familiar sight all over Wales, Scotland and England. This kit has a plastic body with white metal and etched brass fittings. Built by the GER from 1901 to 1908. Some of these vans survived until the 1950’s. Similar Vans were built by Hurst Nielson from 1900 to 1923 for private companies around the country. These wagons would have been a familiar sight all over Wales, Scotland and England. This is an etched brass kit with white metal fittings. Built from 1895 to 1901 by the S&DJR. In 1914 those wagons that were in revenue service would have passed to either the LSWR or to the Midland, with those being used as service stock would have remained in S&DJR livery until 1930. There is no data of what happened to them after this date. Similar wagons were built by other wagon works around the country for the transportation of Lime. These wagons would have been a familiar sight all over Wales, Scotland and England. This kit has a plastic body with white metal and etched brass fittings. Built by the SECR in 1901, with some van surviving until the 1950’s. Similar Vans were built by Hurst Nielson from 1900 to 1923 for private companies around the country. These wagons would have been a familiar sight all over Wales, Scotland and England. This is an etched brass kit with white metal fittings. Built from 1890 to 1901 by the North British some survived in revenue traffic until late 1940’s. These wagons would have been a familiar sight all over Scotland and the north of England, with some venturing even further afield. This kit has a plastic body with white metal and etched brass fittings. Built from 1900 to 1902 by the Furness, a number of these wagons survived in revenue traffic until 1950’s at various locations around the country. This kit has a plastic body with white metal and etched brass fittings. Built for the S&DJR by both the Midland Railway at Derby and by some outside contractors. This wagon was basically the Midland’s standard 16ft 6inch box van fitted with cupboard doors instead of the sliding door. In 1914 those wagons that were in revenue service would have passed to either the LSWR or to the Midland. These wagons would have been a familiar sight all over Wales, Scotland and England. This kit has a plastic body with white metal and etched brass fittings. Built from 1898 to 1906 by the GER some survived until 1960’s with a number being preserved. These wagons would have been a familiar sight all over Wales, Scotland and England. This kit has a plastic body, etched brass chassis and roof with white metal fittings. Built from 1895 to 1902 by the Caledonian, a number of these wagons survived in revenue traffic until 1950’s at various locations around the country. This kit has a plastic body with white metal and etched brass fittings. Built from 1911 to 1915 by the North Staffordshire railway with some survived until 1950’s. These wagons would have been a familiar sight all over Wales, Scotland and England. This kit has a plastic body with white metal and etched brass fittings. Built by Midland Railway, at their Derby works. This wagon was basically the Midland’s standard 16ft 6inch box van fitted with cupboard doors instead of the sliding door and windows in the ends. This kit has a plastic body with white metal and etched brass fittings. The is kit represent standard the standard Gloucester CWCo 4 plank design which were sold mainly to private owners however 50 were delivered to the Furness in 1900 some survived in revenue traffic until 1958 when they were sold out of service where some lasted until 1981. This kit has a plastic body with white metal and etched brass fittings. Built by Wright and Sons for a number of railway companies from 1869 and surviving until the regulations on dumb buffered wagons changed in 1914. These wagons would have been a familiar sight all over Wales, Scotland and England. This kit has a plastic body with white metal and etched brass fittings including LNWR, Cambrian, Mid-Wales and Furness parts. Built from 1898 to 1906 by the GER some survived until 1960’s. These wagons would have been a familiar sight all over Wales, Scotland and England. This is an etched brass kit with white metal fittings. Built from 1899 for the Port Talbot Railway and transferred to the GWR in 1908 when the PTR was bought out. Some examples survived until 1950/60’s. These wagons would have been a familiar sight all over Wales, Scotland and England. This kit has a plastic body, etched brass chassis with white metal fittings. Built from 1899 to 1914 by the various wagon works around the country some survived until 1950’s. These wagons were bought by the East and West Yorkshire Union Railway for use as both a coal and general goods. Photographs of these wagons are rare one near Wakefield, one at Dingwall in the highlands. The wagons were also bought by the Lancashire Derbyshire and East Coast Railway and there were transferred to the Great Central Railway in 1908 who used these wagons for loco coal. These wagons would have been a familiar sight all over Wales, Scotland and England. This kit has a plastic body, etched brass chassis with white metal fittings. Built from 1888 to 1893 by the GWR with some surviving until the 1930’s. These wagons would have been a familiar sight all over Wales and England. This kit has a plastic body, etched brass chassis and roof with white metal fittings. Built from 1898 to 1906 by the GER some survived until 1960’s. These wagons would have been a familiar sight all over Eastern England. This kit has a plastic body, etched brass chassis with brass and white metal fittings. Built from 1898 to 1906 by the GER some survived until 1940’s. These wagons would have been a familiar sight all over Eastern England. This kit has a plastic body, etched brass chassis with brass and white metal fittings. 17 of these small vans were built from 1891 to 1901 in the by the NER with one survived until 1950’s. These wagons would have been a familiar sight all over Scotland and the north of England, with some venturing even further afield. This kit has an etched body and plastic chassis with white metal fittings. 35 of these small vans were built from 1875 to 1901 in the by the LNWR with one survived until 1940’s. These wagons would have been a familiar sight all over England, Wales and Scotland. This kit has an etched body and plastic chassis with white metal fittings. Over 21, 000 of these wagons were built between 1889 and 1921. 5000 lasted until 1947 in railway ownership and many more owned by collieries around the north of England and southern Scotland. This kit has a plastic body with white metal and etched brass fittings. Built from 1898 to 1906 by the GER with some survived until 1960’s with a number being preserved. This kit has a plastic body, etched brass chassis with brass and white metal fittings. The wagons were also bought by the Lancashire Derbyshire and East Coast Railway and there were transferred to the Great Central Railway in 1908 who used these wagons for loco coal. These wagons would have been a familiar sight all over Scotland and England. This kit has a plastic body, etched brass chassis with white metal fittings. 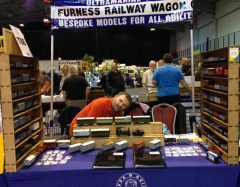 This kit represents 75% of the total wagon stock of the Cambrian Railway. This kit can be built into two variants a fixed sided or drop side. These wagon would have been seen all over mainland Britain. Built from 1898 to 1914 this van was the GNoSR’s standard cattle van. These wagons would have been a familiar sight all over Scotland and the north of England, with some venturing even further afield. This kit has a plastic body and chassis with etched brass and white metal fittings. Built from 1880 to 1890 this van was the CR’S first standard cattle van These wagons would have been a familiar sight all over Scotland and the north of England, with some venturing even further afield. This kit has a plastic body and chassis with etched brass and white metal fittings. Between 1900 and 1909, the Great Eastern Railway Company ordered a total of 800 10ton large cattle vans from the company’s own wagon works at Temple mills. The vans were built with outside frames and mounted on a steel under-frame. The vans were used to convey livestock to and from East Anglia although some of the wagons where photographed as far away as northern Scotland and south west England. This kit has a plastic body, etched brass chassis and roof with white metal fittings. Built from 1890 to 1901 by the North British some survived in revenue traffic until late 1940’s. These wagons would have been a familiar sight all over Scotland and the North of England, with some venturing even further afield. This kit has a plastic body with white metal and etched brass fittings. Now includes drop-side and centre door parts. This kit represents the Caledonian Railway’s standard 4 plank open wagon design built from about 1888 to 1914. These wagons would have been a familiar sight all over Scotland and the north of England, with some venturing even further afield. These wagons were also built in large numbers by the Highland railway from 1896 to 1910. This wagon represents the backbone of the Highland’s goods stock. These wagons were maid of all work and would have been seen all over Scotland and northern England. This kit has a plastic body with white metal and etched brass fittings. This kit represents wagons built to the 1909 RCH specification for a 12 ton seven plank coal wagon. These wagons were built in vast numbers by a number of different builders around the country. The kit builds two variants the more numerous side door only and the less numerous side and end door. Although designed with the private owner in mind these wagons were bought in large numbers, before the First World War, by the SE&CR (Both variants) and LB&SCR (Side door only). The War Dept bought thousands of both variants between1914 and 1918 and these were sold on after the war to many railway companies including the GNR as well as private owners. This kit has a plastic body and chassis with etched brass and white metal fittings. The G&SWR started to build a new version of their 10t box van in 1919. The van was the same dimensions as the previous van but had a steel under-frame and steel ‘T’ sections on the ends. This van was the last evolution on the G&SWR van and when production stopped in 1922 over 200 of these vans had been built. Due to the common user policy that had been introduced in World War 1 these wagons would have travelled all over the country and not just in their native Scotland. This kit has a plastic body, etched brass chassis and roof with white metal fittings. Built from 1887 and 1923 this van was the GNoSR’s standard open goods wagon. These wagons would have been a familiar sight all over Scotland and the north of England, with some venturing even further afield. This kit has a plastic body and chassis with etched brass and white metal fittings. Over 21, 000 of these wagons were built between 1889 and 1922. 8000 lasted until 1947 in railway ownership and many more owned by collieries around the north of England and southern Scotland. This kit has a plastic body with white metal and etched brass fittings. This kit represents the Caledonian Railway’s standard 4 plank mineral wagon design built from about 1888 to 1914. These wagons would have been a familiar sight all over Scotland and the north of England, with some venturing even further afield. – This kit has a plastic body and chassis with etched brass and white metal fittings. The G&SWR ordered 930 steel under-framed versions of their 12t Mineral wagon in 1899 from RY Pickering’s. The wagons were slightly longer than the previous 12t minerals, but still retained the cupboard side doors and both end doors. The G&SWR went down the route of having wagons fitted with two end doors because Ayr Docks was not equipped with wagon turntables and wagons pointing in the wrong direction could not be discharged. Due to the common user policy that had been introduced during World War 1 these wagons would have travelled all over the country as well as in their native Scotland. This kit has a plastic body, etched brass chassis with etched brass and white metal fittings. This kit represents the NER’s diagram C1 Open Fish Truck. Approximately 410 of these vans were built between 1896 and 1906. 1 of these wagons had long enough live to be nationalised. All of these wagons were dual fitted with Westinghouse and Vacuum braking systems to enable them to be run with passenger trains. In addition to this the NER/LNER ran these wagons in block trains from places like Hull to London and other large cities. These wagons were built for the GWR, “North and Rose” in ST. Austell and North Cornwall China Clay Company Wenford Bridge in Cornwall. It is thought that they were built around 1890 and there for would have been withdrawn from service about 1945. North and Rose and North Cornwall China Clay Company became part of English China Clay in 1919 and therefore the wagons would have been repainted their livery. This kit represents the NER’s diagram F4 Perishable goods van. Approximately 600 of these vans were built between 1897 and 1906. 17 of these wagons had long enough lives to be nationalised. All of these vans were dual fitted with Westinghouse and Vacuum braking systems to enable them to be run with passenger trains. These wagons were used to convey all sorts of perishable goods from milk to fish and would have been a common sight around Britain. This kit represents the Lancashire and Yorkshire Railway’s standard 3 plank open wagon design built from about 1888 to 1900. These wagons would have been a familiar sight all over northern England and Scotland and some venturing even further afield. This kit has a plastic body with white metal and etched brass fittings. This kit represents wagons built to the 1909 RCH specification for a 12 ton seven plank coal wagon. These wagons were built in vast numbers by a number of different builders around the country. Although designed with the private owner in mind these wagons were bought in large numbers, before the First World War, by the Highland Railway. The War Dept. bought thousands of this wagons between 1914 and 1918 and these were sold on after the war to many private owners. This kit has a plastic body and chassis with etched brass and white metal fittings. Between 1898 and 1912 the S&DJR build over 43 2 plank open wagons for use in the movement of general goods. These wagons were original built with fixed sides and rated at 8 tons but after 1904 they were built with a centre drop door in each side and some were up rated to 10 tons. In 1914 all of the S&DJR’S revenue earning wagons were split between evenly the Midland and the LSWR. All departmental stock was retained in S&DJR livery until 1930. The kit represents the NER Central Division’s standard coke wagons. The kit can build both the R2 (two rave) and R4 (3 rave) adaption of their standard P5 coal hopper. The R4 hoppers were either reduced in height and turned into R2s or sold off as private owner wagons for the north Durham coke traffic. The kit represents the NER 10ton loco coal wagon built from 1889. As larger capacity wagons came into use these wagons were transferred to the goods dept. for use as high goods wagons. 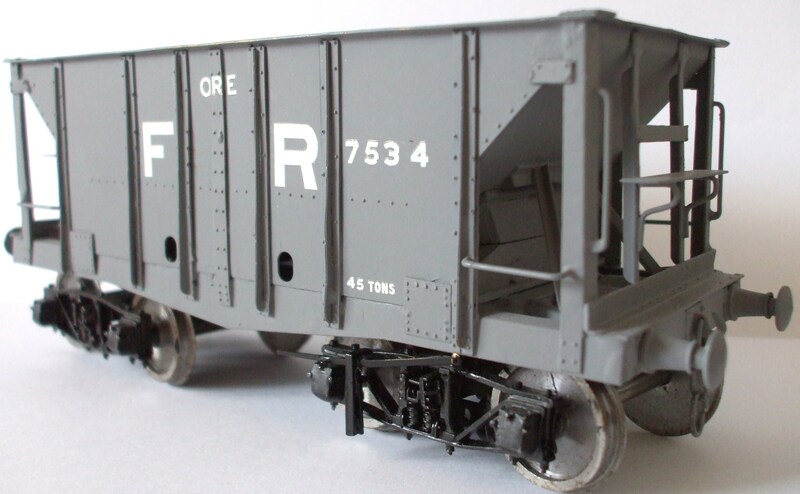 This kit represents an SECR 10ton 4PLK drop side General Merchandise Wagon. They were built between 1901 and 1910 and were bought in three batches from a contractor. In 1915 these wagons were commandeered by the War office for overseas service. In the 1920’s the SR moved some of these wagon to the Isle of White. In 1895 the Rhymney Railway ordered 12 of these wagons numbering them 679 to 690 from Ashbury’s. They were originally allocated to carrying general merchandise but by 1923 most of these wagons had been transferred to the locomotive department for use as loco coal wagons. All of the wagons were absorbed into the GWR, and renumbered 23569 to 23580, but only a few would have been in service by the end of 1936. Dia. 1. 1 Plank/Dia. 32A. Single Bolster These wagons were built by the Lancashire and Yorkshire railway between 1876 and 1920. Most of the later wagons would have been passed to the LMS in 1923 with most of the later batches reaching BR in 1947. Both diagrams were commandeered by the war department between 1915 and 1919. During this time they were repainted W^D green. In 1898 and 1918 the Somerset and Dorset Railway built a number 20ton 6 wheel brake van for use on heavy goods and coal trains crossing the Mendips. When the S&DJR goods stock was split between the MR and LSWR, brake vans were not included and would have still been in S&DJR livery in 1930 when they were allocated to the LMS. Some of these vans managed to last into early British Railways. This represents the Great North of Scotland Railway’s 14/17ton Brake Van. These over 60 vans were built in batches between 1895 and 1919. Their differences in tare weight was due to either grease or oil lubrication axel boxes. Most of these were taken into LNER ownership in 1923, but all had been withdrawn by 1946. The Lancashire and Yorkshire railway built 19 gunpowder vans, to diagram 60, between 1904 and 1911 as direct response to problems that had arisen during the Boar Wars. The design of the GWR mink lined with lead and with no vents was chosen. This design was adopted by a number of other railway companies for gunpowder van at this time. Axel boxes, brakes and buffers followed standard LYR practice of the time. Most of these vans would have made it through the Second World War to British Railway owned in 1947. These wagons were built in batches by the NER, between 1886 and 1900, for the sole purpose of delivering general goods. Later in life these wagons came into service stock as they were replaced by larger capacity wagons. A large number of these wagon passed to the LNER in 1923 a few were still in service as loco coal wagons but the majority were in the high goods role. by 1947 there were only 2 of these wagons left in departmental stock. This kit represents standard Caledonian and highland railway four plank open wagons (FRWC47) that had been converted for carry sheep. This was done with the addition of ribs to the floors and what looked like coke raves to the sides increasing the height of the wagons to prevent the sheep jumping out. These wagons represent a standard 4 plank wagon design produced by the Lincoln Wagon and Engine Co from about 1890. These wagons were built for the private owner market and would have been a common site across the UK including the area of England controlled by the NER. Each company would have had their own livery and the wagons were registered to a number of different railway companies across the UK. It is not known if any of these wagons were pooled during world war 2 but it is very likely that some were. If any of these wagon were nationalised they would have probably been scrapped before 1950. In 1905 the Midland Railway company ordered a 225 8ton Banana vans. These wagons were built by the Midland Railway, in Derby. They were similar to the standard Midland design but they had twin cupboard doors rather than the sliding one of the Midland. In addition the vans had two vents in each end. This represents the GNoSR’s standard box van. Over 130 were built in batched between 1902 and 1909. All were taken into LNER ownership in 1923, all but 18 had been scrapped by 1940 and only 1 being in use in 1947. This represents the Northern Eastern Railway’s standard box van. Over 1500 were built in batched between 1886 and 1903. 1176 were taken into LNER ownership in 1923, all but 6 had been scrapped by 1940 and no of these were in use by the goods department. 2 service vehicles did manage to survive in to preservation. This represents the Great Northern Railway’s standard, large, cattle van. 474 were built in batched between 1885 and 1910, at their Doncaster works. 305 were taken into LNER ownership in 1923, all but 6 had been scrapped by 1947 and all would have been scrapped by 1955. In 1870 the GNR introduced a standard 4 plank open wagon design as its standard open goods wagon. by the time production of these wagon ceased in 1906 over 13, 000 had been built, 12, 400 with wooden under-frames with another 600 with steel under-frames. Over 700 of these wagons lived long enough to get to the grouping with the going to the LNER and 30 being withdrawn by British Railways in the 1950’s. The Barry Rly built iron vans, to diagram, in 1897. The design was similar to the standard GWR mink with minor detail differences. Axel boxes, brakes and buffers followed standard Barry practice of the time. In 1896 the London Brighton and South Coast Railway Company ordered a batch of 30 6ton 3 plank, general merchandise wagons from the company’s own works. These wagons were built to a modern design with a steel channel under-frame. The wagons were mainly used to convey general merchandise from between the south east and London although some of the wagons where photograph as far away as northern Scotland and south west England. In later years these wagons were relegated to engineers department for use as ballast wagons. Between 1896 and 1900 the London Brighton and South Coast Railway Company ordered a 4 batches of 10ton 5 plank, raised ended, general merchandise wagons from the Cravens and BRCW. A total of 1, 246 wagons were built. These wagons were built to a modern design with a steel channel under-frame. The wagons were mainly used to convey general merchandise from between the south east and London although some of the wagons where photograph as far away as northern Scotland and south west England. In later years these wagons were relegated to engineers. The GWR built 36 gunpowder vans, to diagram Z1, in 1897. The design was the standard GWR mink lined with lead and with no vents and steel doors. This design was adopted by a number of other railway companies for gunpowder van at this time. Axel boxes, brakes and buffers followed standard GWR practice of the time. This kit represents the S&DJR’s standard 10ton goods brake van. 16 were built between 1879 and 1888 these vans would have been a familiar site in there S&DJR livery until 1930 when they were repainted in LMS livery. These vans would have been seen anywhere from Bath to Bournemouth. Built from 1890 to 1901 by the North British some survived in revenue traffic until late 1940’s. These wagons would have been a familiar sight all over Scotland and the North of England, with some venturing even further afield. This kit has a plastic body with white metal and etched brass fittings. Kit includes fixed/drop-side and centre door parts. Dia. 6. 7 Plank loco coal wagon built by the Lancashire and Yorkshire railway between 1898 and 1910. Most of the later wagons would have been passed to the LMS in 1923 with most of the later batches reaching BR in 1947. The kit represents the LYR’s first use of the double ended coal wagon. 10 were built in 1898. These wagons were the same size the loco coal wagons (FRWC96) but had no side doors and two end doors. Very little is known about the use of these wagons but they must have been reasonably successful as although no more of this design were built the design concept became very wide spread through out the LYR’s wagon stock. These wagons were built in batches by the NER, between 1886 and 1900, for the sole purpose of delivering general goods. Later in life these wagons came into service stock as they were replaced by larger capacity wagons. A large number of these wagon passed to the LNER in 1923 a few were still in service as loco coal wagons but the majority were in the high goods role. by 1947 there were only 2 of these wagons left in departmental stock. The TVR built over 50 3plank, to diagram, Between 1897 and 1910. Axel boxes, brakes and buffers followed standard TVR practice of the time. The Barry Rly built 30 1 plank, 41 to diagram, Between 1890 and 1898. Axel boxes, brakes and buffers followed standard Barry practice of the time. This kit represents the S&DJR’s version of the standard Midland railway’s 3 plank dropside wagon. These wagons were used for both engineers department as well as the traffic department. Those in the traffic department were split between the MR and LSWR in 1914 but those in use by the engineers department remained in their S&DJR livery until 1930. The LBSCR built 120 of these 7-9-10-12ton vans between 1888 and 1908. Designed by Robert Billington to be an improvement on the vans built by Stroudly. 7 9ton vans, 89 10ton vans and 14 12ton vans were taken into Southern Rly ownership in 1923. The last van of the type was withdrawn by British railways in 1950 it has servived as the branch brake on the Hayling Island branch.